Dr. McCarter received her undergraduate degree from Vanderbilt University in Nashville, TN and received her medical degree from University of Cincinnati College of Medicine in Cincinnati, OH. Dr. McCarter did her residency training with Louisiana State University Department of Surgery in New Orleans and completed her residency training with Morehouse Department of Surgery in Atlanta. She is board certified in General Surgery and is a fellow of the American College of Surgeons. 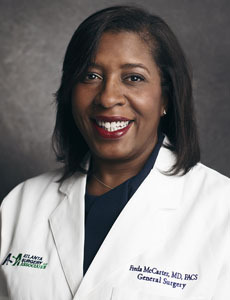 She is a member of several professional organizations including the American Medical Association, Georgia Medical Association, the Georgia Chapter of The American College of Surgeons, the Atlanta Medical Association, and the American Society of Breast Surgeons. Dr. McCarter is a native of Louisiana.